Vanquish Volante - Style. Class. And stunningly fun. Proportion, presence, purity. 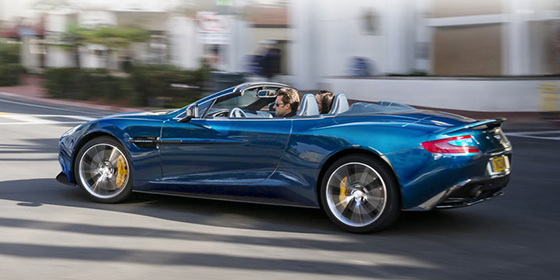 Vanquish Volante delivers the most beautiful body-shape in its class. Subtle changes needed extensive design work. All new aerodynamically tuned decklid and tonneau. New full-height windscreen with glass directly meeting roof. First fully carbon-fibre skinned Volante. Taking something away allowed us to add so much more. Producing the same range-topping performance achieved in Vanquish Coupe in Vanquish Volante was an engineering challenge a challenge we passed. Powered by the same AM11 V12 engine, acceleration of 4.1secs and peak power of 565 HP ensures this is the quickest accelerating Volante weve produced. Its also the stiffest with a body which maintains all the dynamic agility of Vanquish Coupe. Vanquish Volante is the most technologically innovative convertible weve ever made, truly engineered to be a convertible. The three layer lightweight fabric roof takes just 14secs to fold, operating at up to 30mph. 1000W Bang & Olufsen BeoSound system monitors and adapts based on open-top conditions. Boot loading capacity is more than 50% higher than DBS Volante, the same if the roof is up or down. All of the finishes, the authentic materials, the exquisite details from Vanquish Coupe but more eyes will enjoy them. The all-new centre stack inspired by One-77 combines elegance and ergonomics. A cabin that can be tailored in thousands of unique colour and material combinations offers bold contrasts or subtle styling. A roof that's simple to use and simple to change. We designed Vanquish Volante without complication or clutter. Taking just 14 secs to remove, with just one button push, the lightweight fabric roof fits snugly beneath the tonneau cover with no impact on exterior styling. Whats more, you dont have to stop, the Vanquish Volante roof can be folded at up to 30mph. Advanced carbon-fibre allowed us to create the now iconic Vanquish rear aero-duct. Optimised for Vanquish Volante this single moulded piece improves downforce and aerodynamic performance. Taking over two days to make, this integral part combines detailed craftsmanship and purity of form. Vanquish Volante also sees the subtle integration of the rear stop lamp, blending it into the surface of the decklid. Only Aston Martin could create a convertible which maintained the aerodynamic performance of a coupe. Stability at speed. Sharp cornering. Minimised drag. The combination of re-engineered body panels and the advanced rear aero-duct help create lift balance whether the roof is up or down.